Austria. The 1st set, actually, has been made in Mittenwald, a small town in southern Germany, next to the border with Austria. I listed the set at Austria because of the theme of Austrians against the Turks. Austria. The second set is a bit of mystery to me. Considering the style and presentation, I suspect it from Austria, Northern Italy or South Germany and of recent date. The pieces are marked with a three-pointed star as you can see at the base of the white rook, but I don't know what that means. Czechia. These Ore Mountains sets are sold in a kind of letterbox/shelf, of which the back holds the chess board. Normally there are checker counters too. I do have only the chess pieces. See Hungary page for a set with similar rooks. 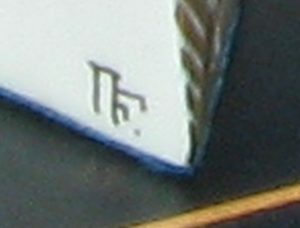 On internet, at similar sets, some say these sets are Hungarian. Czechia. I have bought the 2nd set in Prague, but the pieces are made in moulds of the Irish company Prince August: PA713: Field of the Cloth of Gold: Henry VIII's side and PA714: Field of the Cloth of Gold: Francis 1st's side. The painting, which has been done very nicely, could have been done in Czechia or elsewhere. England, by SAC, "SAC-F601, Battle of the Alamo"
England, by SAC, "SAC-F602, The American Civil War"
England, by SAC, "SAC-F603, Waterloo"
England. Unfortunately I do not know anything about Fram Cook, nor I could find here at the internet. Greece. Actually I do not know much of these chess sets. The 1st set is definitively Greek. Greece. The 3rd set is still for sale today. This is what is stated at the Manopoulos side about this set: "This period was characterized by fierce local as well as international wars. The aggressiveness of the Pawn and the Knight fully represent the ferocity of these wars. The posture of the King and Queen indicates their unquestionable leadership. The Bishop reveals his consideration for the movements of the imminent battle. Finally, the Castle is a reproduction of a pillar which characterized the architectural style during that period." Scotland. The "Lewis" chess men are the most documented pieces in the world. Numerous books and articles have been spent on them, but still they are a bit mysterious. Also numerous replicas have been made, in all kinds of material. This resin SAC (Studio Anne Carlton, now in Folkestone, Kent, UK) set seems to be quite accurate, although the red colour is hardly seen at the originals. Maybe I should have listed this at the "To Play With" menu, but who can tell whether the original pieces were ever made to play with or for decoration only. Spain. The wooden set with Spanish motives was bought at Las Palmas in 1975. I can not say more about it. Spain. 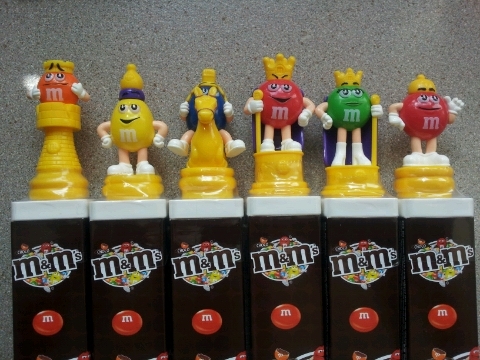 The spooky resin chess set was bought in Barcelona in 2002. I do not know more. Switzerland. Bears have a long and rather one-sided relationship enjoyed with Switzerland's capital Bern. According to a legend has Berthold V of Zähringen Bern named after the first animal that was killed at a yacht during the Foundation of the city in 1191. The 1923 Edition of Muirhead's Switzerland explains: whatever the real relationship of the word bear and Bern is, the figure of a bear appears on the oldest known city seal (1224), and by the city paid living bears are held in Bern since 1513 (except for a short period when French took them to Paris in 1798). The very pretty 1st set came in a very nice box. Not a chess box of course. The 2nd set came in its original box with a label stating 1840 and centimes 16. Not sure how much that would be today. Switzerland. 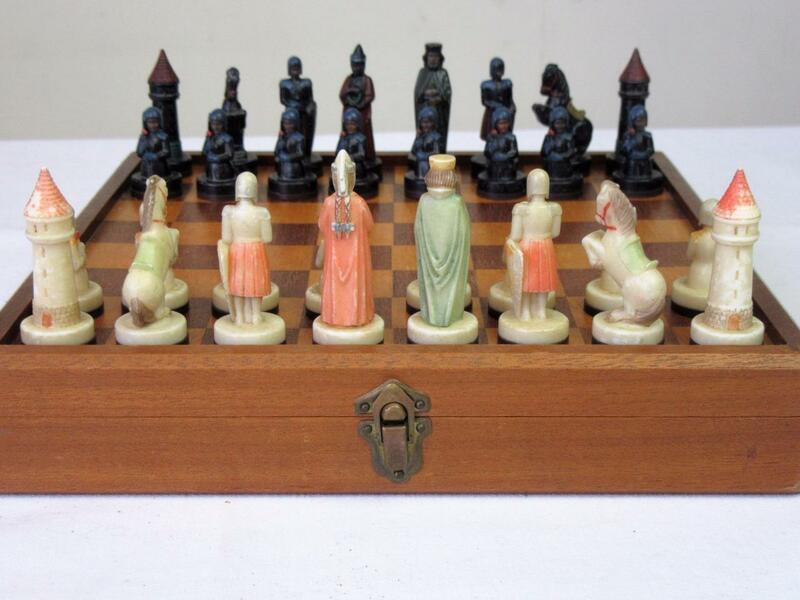 The 3rd set listed is a modern wood cut chess set.